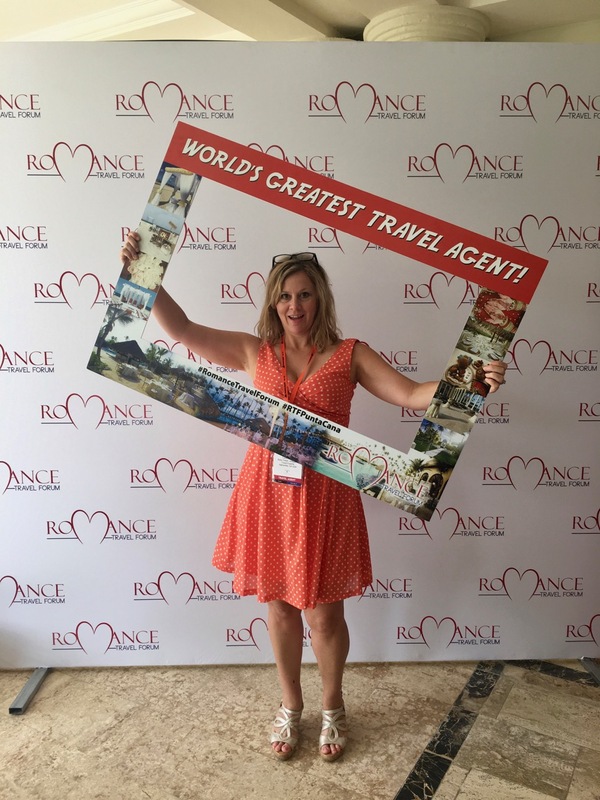 Recently, I was invited to attend the Romance Travel Forum in Punta Cana. The Forum is a by invitation only conference of high producing travel professionals specializing in Destination Weddings and Honeymoons. 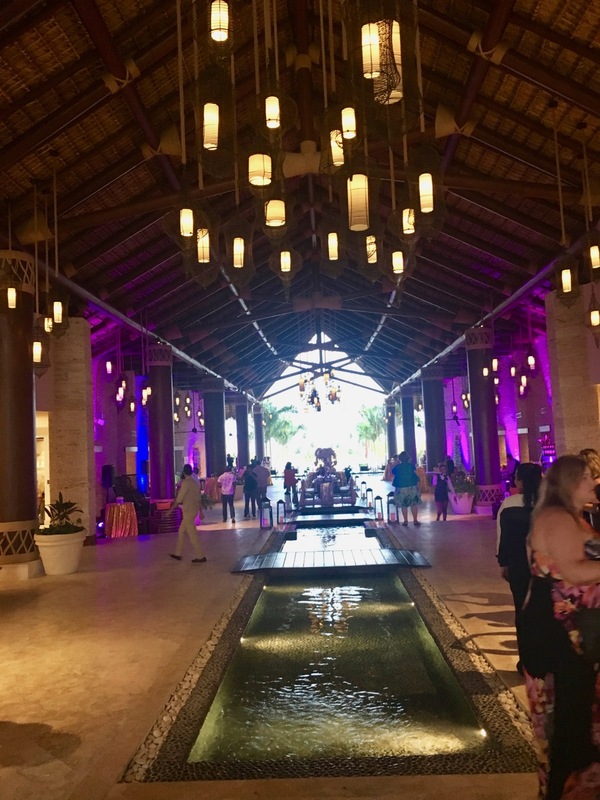 The Romance Travel Forum was held at the Paradisus Palma Real, home of many Punta Cana honeymoon and Punta Cana destination wedding packages I plan. My clients experiencing a Punta Cana honeymoon get a great value! 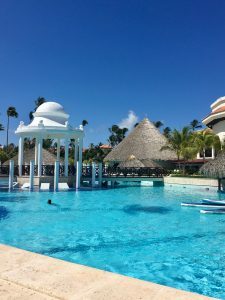 Punta Cana offers a wide array of good all-inclusive options, golden sand beaches, and budget friendly pricing. 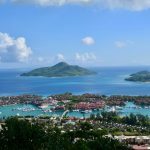 Generally, the budget for a Punta Cana honeymoon sits between a Cancun honeymoon and a Jamaica honeymoon. The resorts are reasonably close to the Punta Cana airport and the US dollar is readily taken. 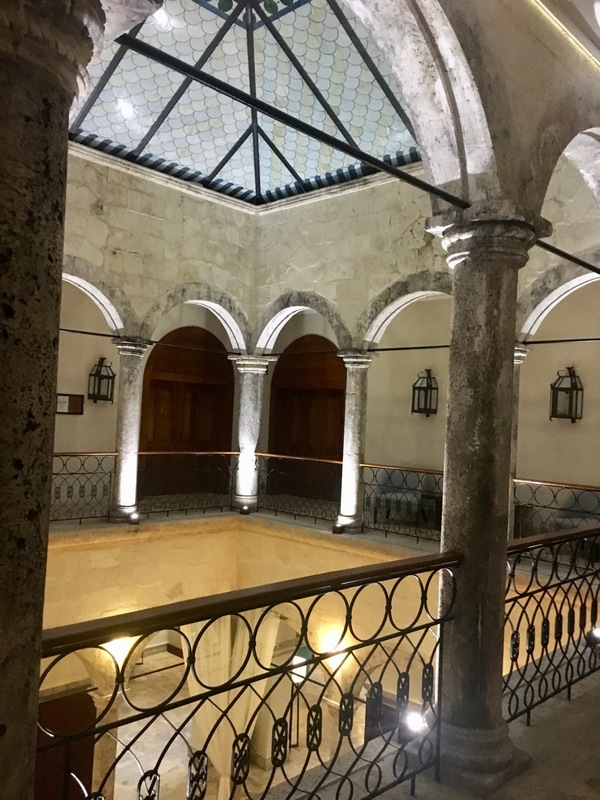 During the Forum, we tour other properties to meet the onsite wedding and management staff and to discover destination wedding sites (beach wedding anyone?) and decoration trends. 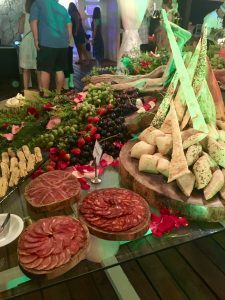 We attended several mock weddings and receptions to view the setups and (most importantly in my book) taste the food and beverage options. It was glorious! 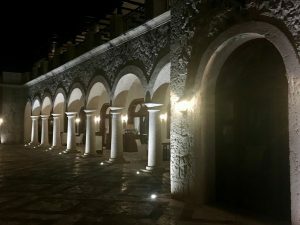 During the Forum, we stayed at the Palma Real, and toured the Paradisus Punta Cana, Secrets Cap Cana (oh man amazing!! 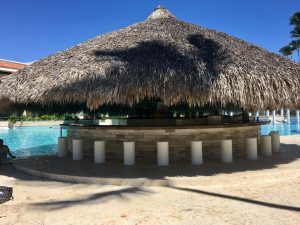 ), the Hard Rock Punta Cana (great entertainment and beach), and the Sanctuary Cap Cana by Alsol (which I loved!). 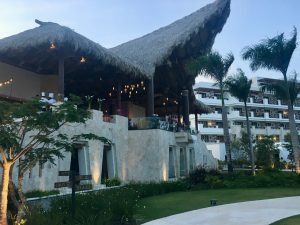 The first thing you need to know about the Paradisus Palma real is that it’s a reasonably large resort. The property offers 550+ rooms. The main drawback is the lack of oceanfront suites/rooms. 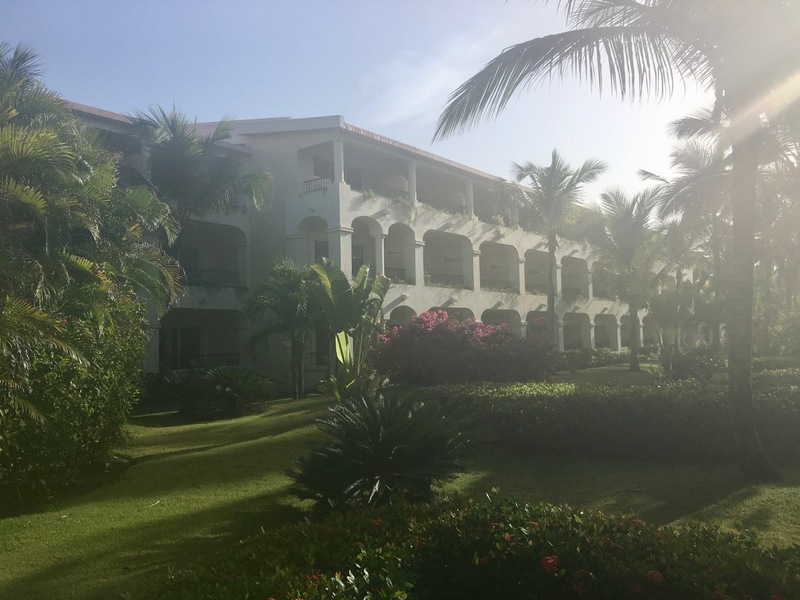 There are only 24 ocean front suites, which is why you may have a difficult time finding an ocean view when looking at availability (somewhat common in Punta Cana). That said, it offers a great value while still giving you a quality Punta Cana honeymoon if an ocean view is not of the highest importance. 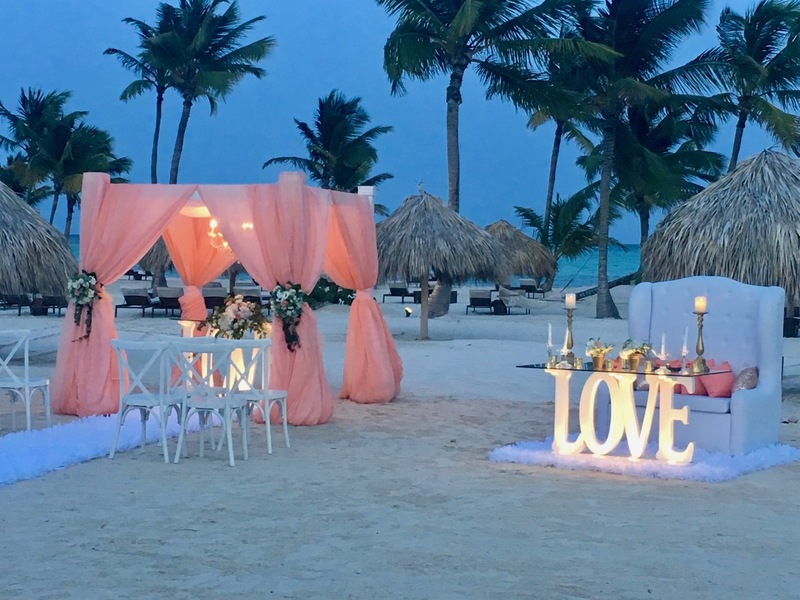 It’s a great destination wedding resort for families (along with Paradisus Punta Cana) as these resorts allow children of all ages to stay on property. 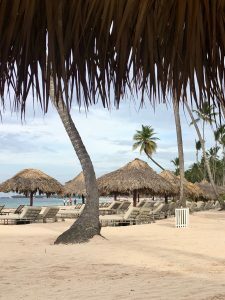 Of the family-friendly, all-inclusive Punta Cana resorts, the Paradisus resorts are at the top for me. 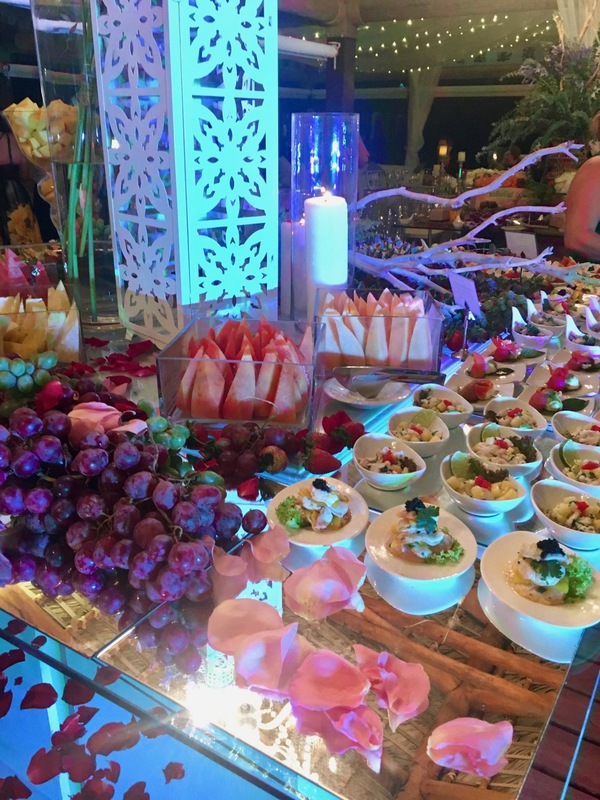 The food and beverage quality is good for an all-inclusive. 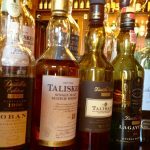 If you’d like additional items such as more elevated wines, champagnes, and spirits, they may be purchased at an additional cost. 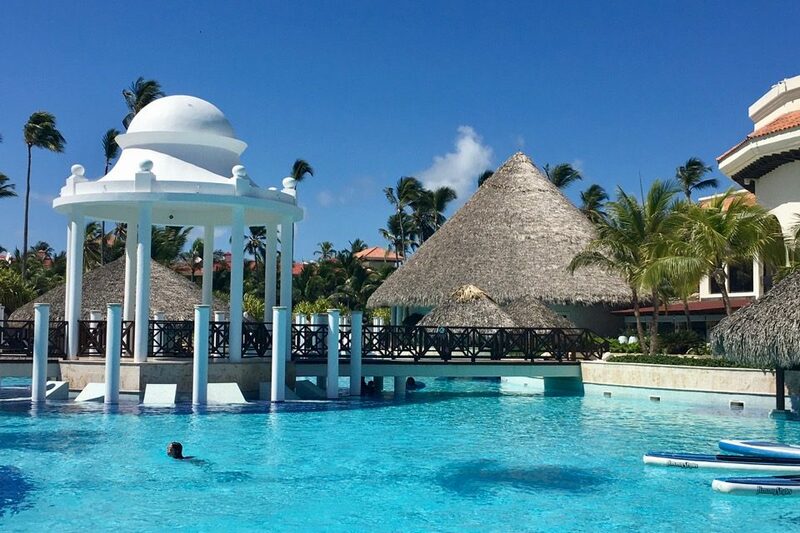 The resort sits on Playa Bavaro and offers five pools and twelve restaurants. Reservations are recommended for the restaurants. Restaurant reservations are arranged onsite and not prior to your arrival date with the exception of group buyouts of a space (for example a wedding reception). The restaurants are a la carte (ie: you order off a menu) with the exception of Naos, which is the buffet restaurant. Please note that there is a dress code for some of the restaurants in the evenings. On this trip, I stayed in the Paradisus Junior Suite, which is the basic room category. 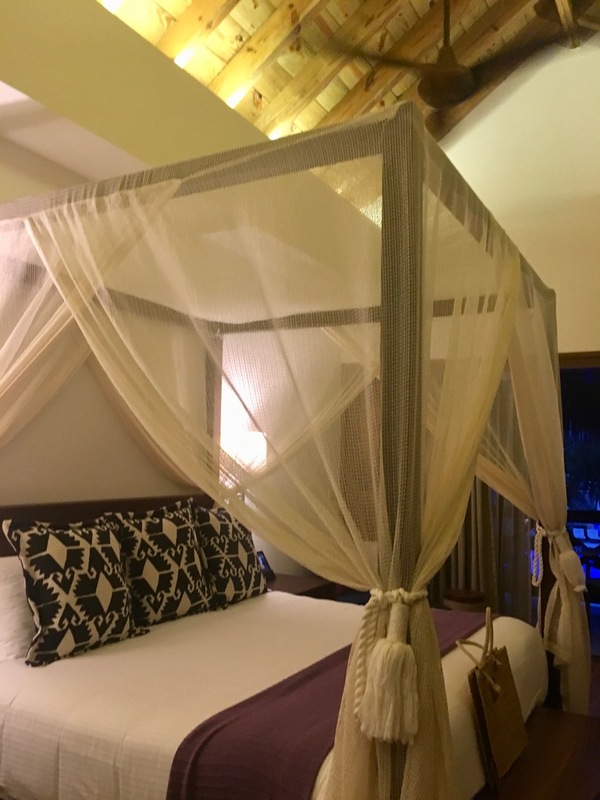 The room was spacious and offered a private balcony overlooking the resort area. Below is a photo of our building, which looks about the same as the other three-floor buildings on the property. It’s a bit fuzzy because it was humid in the morning, and my lens kept fogging up…. 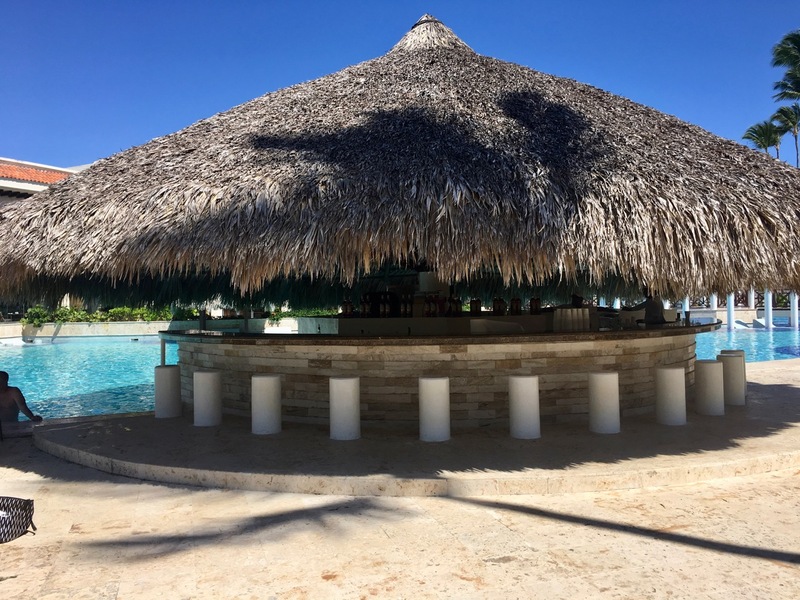 And the swim up bar, where you’d frequently find me…. The Royal Service area is really where you want to be if everyone in your room is 18 and over. With the Royal Service area, you receive butler service, a private Royal Service pool, and most importantly, a Royal Service beach area with upgraded beach chairs and palapas. 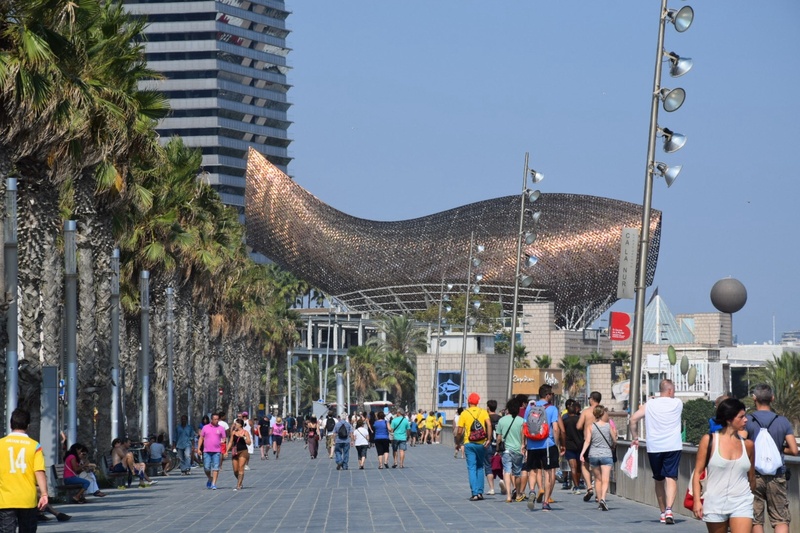 The beach area is a significantly upgraded area–especially in the quality of the chairs, which in the Royal Service area are more like a mattress than a beach chair. Of course, they are all fabulous….the Royal Service Area is just more fabulous. There is also a restaurant dedicated to Royal Service guests. Since this area is adults only, it’s great for honeymooners and brides and grooms in destination weddings to have kid-free relaxation. It’s a beautiful property! 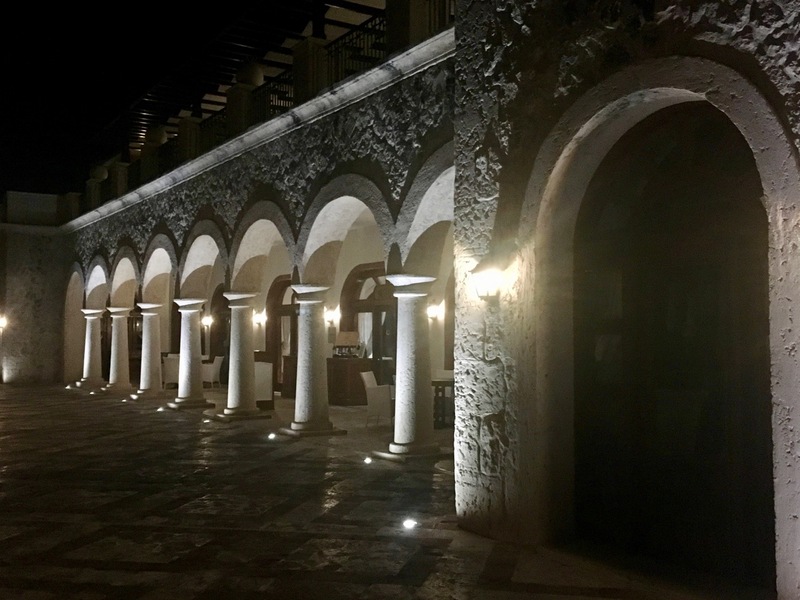 The configuration of the main public area of Paradisus Palma Real is like a hacienda with a main plaza in the center and restaurants along the sides of the corridor, a pool in the middle and the rooms on the outside. The pools are spectacular and I just love the beach! The property feels quite palatial with a beach vibe intermixed. 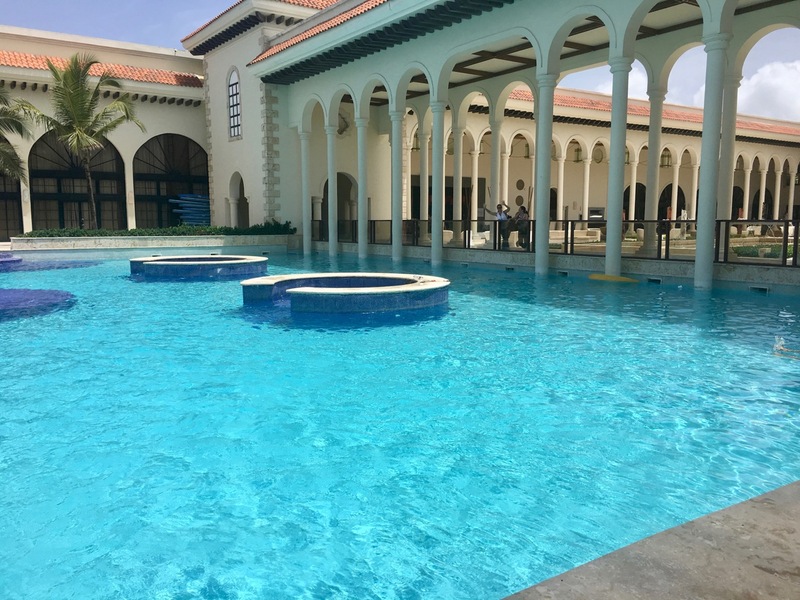 In many ways, I prefer the Parasidus Punta Cana for a Punta Cana honeymoon even though the Paradisus Palma Real is a smidge nicer (a smidge) and smaller. 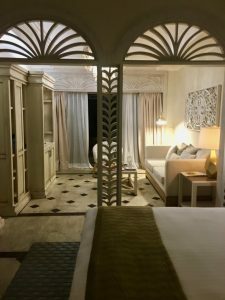 Typically, I like the smaller properties, but I love the way the Paradisus Punta Cana is laid out. 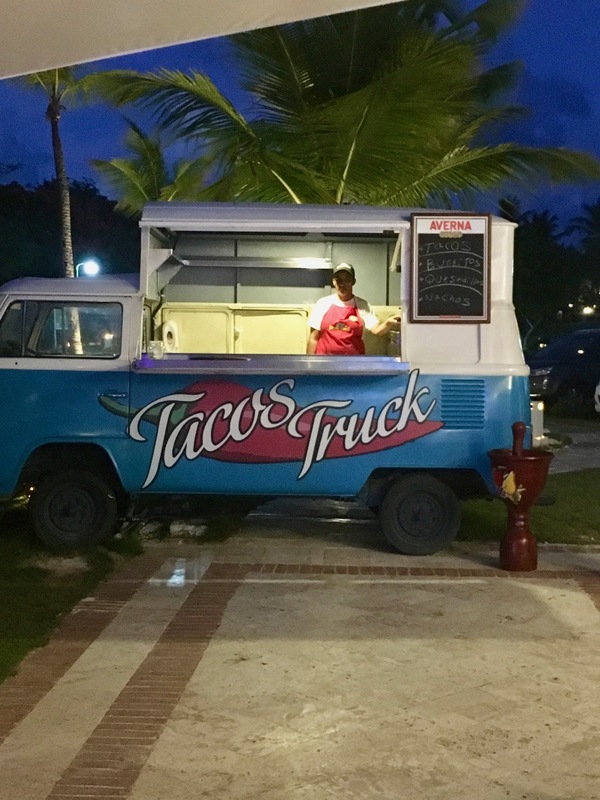 Instead of the hacienda type layout of the public areas and restaurants, the Paradisus Punta Cana has restaurants tucked away along florabundant paths. The public spaces are open and airy and it just feels green and relaxing. It has a lovely Asian feel to it. We had my daughter’s destination wedding at this resort and it was beautiful! It’s a great place for a beach wedding! 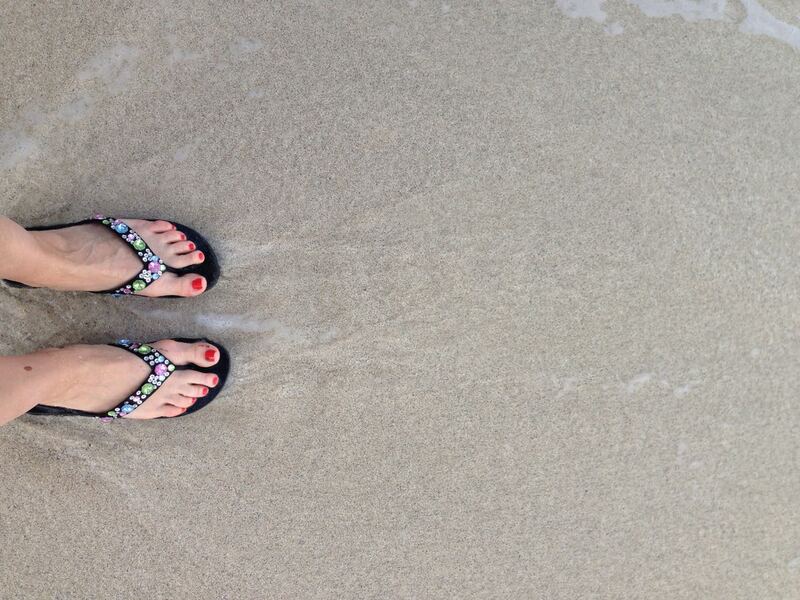 I do love the beach, here…. The property boasts nine restaurants and seven pools. It has 685 rooms. It’s a large and spread out property. I highly recommend the Royal Service area as it’s closer to the beach. I also personally reach out to the sales manager at this property to request my clients traveling with children (ie: not in the Royal Service Area) to be close to the beach if they want. The Reserve area offers larger suites and kid-friendly accommodations and pool, but it is farther from the beach. At this property, if a view is important to you, get the ocean front suites and not the ocean view as the ocean view rooms are really a partial ocean view (like if you stand on the balcony and turn your head just right—maybe even on your tip toes). That said, the Royal Service Ocean view rooms and the Royal Service garden view rooms share a building and are very close to the beach as they sit right behind the ocean front suites. I love love Secrets resorts! I think they are the best all-inclusive brand out there (aside from a few notable, luxury properties). The food is good (for an all-inclusive) as well as the beverages and the service is top notch. This was my first time to view the new property in the Cap Cana area of Punta Cana. 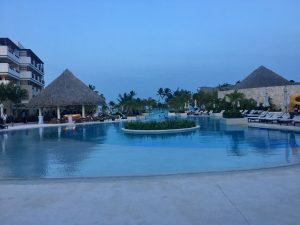 If you want a Punta Cana honeymoon and have the budget for this property, I highly recommend it! 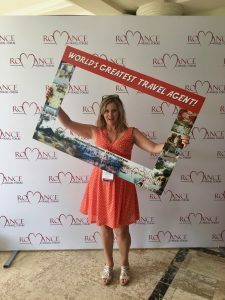 During my stay in Punta Cana at the Romance Travel Forum, I got to know the staff at this resort and I can definitely make your stay special! 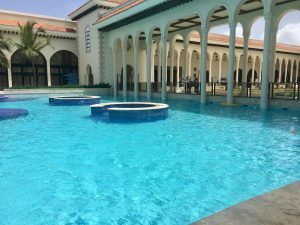 When you drive into Cap Cana, you immediately notice the upscale vibe. Palm trees line the avenue and you know you are somewhere special. The dramatic, thatched roof lobby beckons you inside. As you walk to the end of the lobby, you a glimpse of the pool and swim up bar. 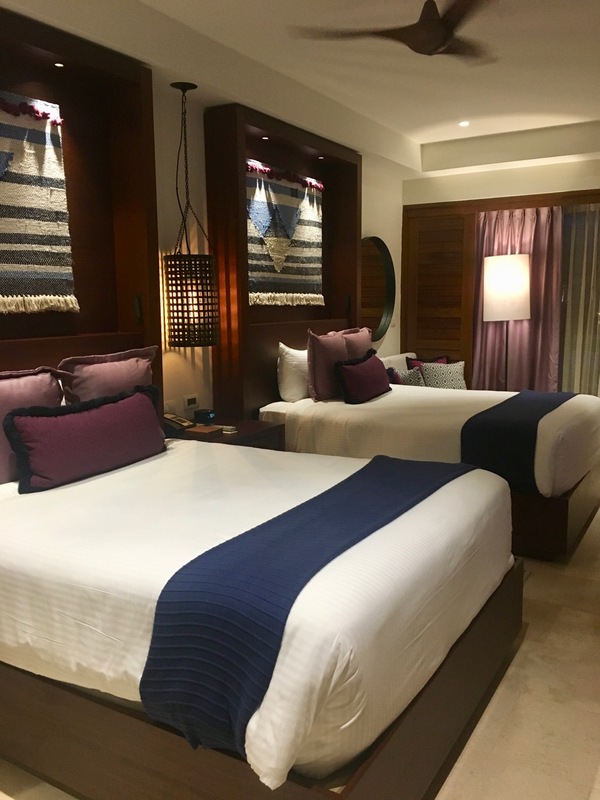 Secrets Cap Cana offers 457 rooms at their adults-only property. 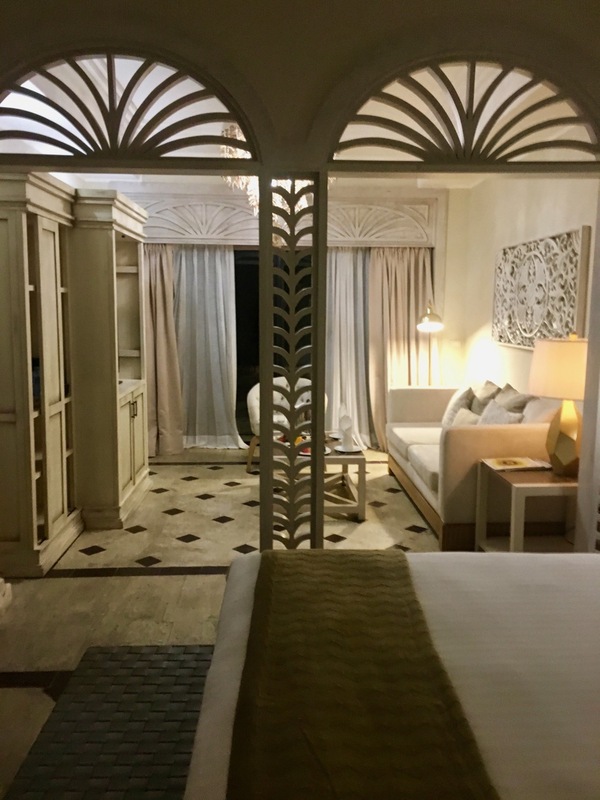 To the left is a photo of the Preferred Club Junior Bungalow Suite and to the right is the decoration for the Junior Suites. As you can see, there are options for two beds. Although this is adults only, it is not oriented to only couples. The beach at Secrets Cap Cana is absolutely beautiful, the bars have an upscale feel, and the rooms are modern. I loved the feel of the Rendezvous lounge at this property. Many times, I prefer the bars closer to the beach and not in the main lounge area, but this one feels like an upscale bar you’d go to at home. 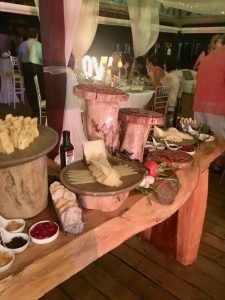 The restaurants at the Secrets Resorts have standard names and cuisines—you won’t find a lot of divergence from property to property with perhaps one different restaurant at each location (for example the Jamaican restaurant at Secrets Wild Orchid/St James). Reservations are not allowed at the restaurants. If the restaurant is full, you’ll be handed a light-up pager to take to the nearest lounge to wait. In my experience, the wait is not long if there is a wait at all. I actually prefer to not have reservations in the all-inclusive restaurants because I feel I can try more restaurants that way. Sometimes the resorts who take reservations have restaurants that are full a lot because the restaurants are small and it can be difficult to confirm a reservation–or a lot of people make reservations and change them making it difficult to secure your preferred options in advance. The preferred club is the concierge club area of the resort. Now I do have to say that the upgraded mini bar they advertise is not all that and a bag of chips… it pretty much consists of a few assorted airplane bottles of liquer each night and snacks such as M&Ms, Pringles, etc. It’s the same at all the Secrets Resorts. That does not float my boat….at.all. 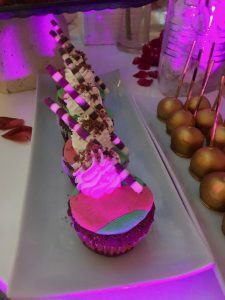 That said, the Preferred Club rooms are typically in a better area and you have a private preferred club beach area (not always strictly enforced) and pool area plus the private lounge with food presentations. You also have a bar in the lounge where you can easily get a mimosa before the other bars open. 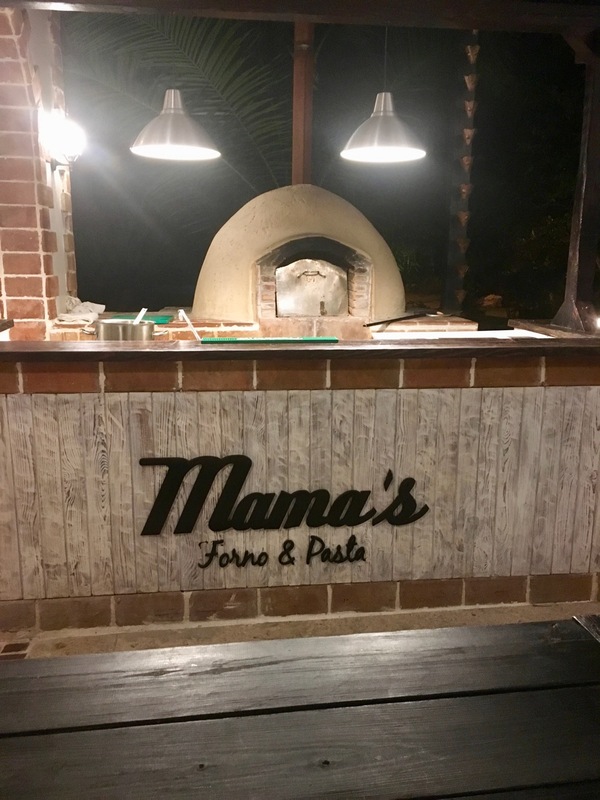 We had our event in the steak house, which uses a cast iron and brick oven that uses charcoal and wood fire…..oh man….speaking my food love language—fire!!! 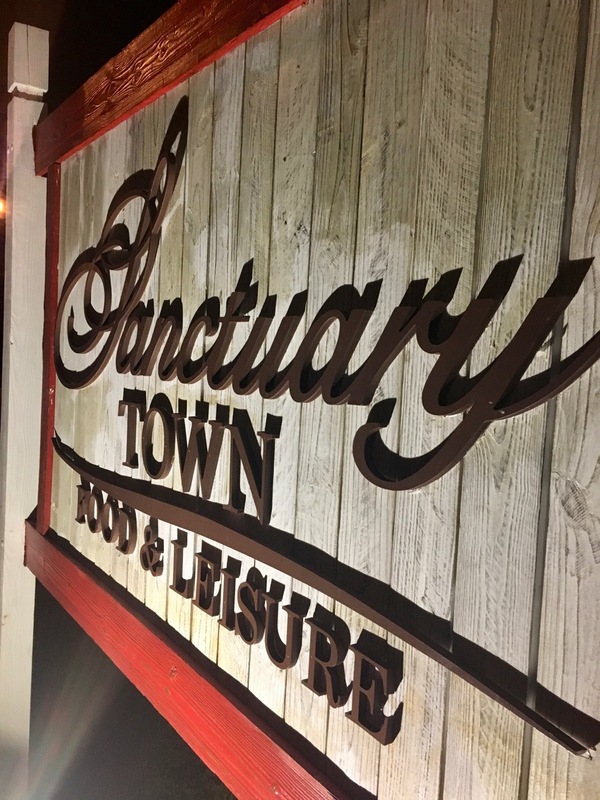 The Sanctuary has a feel of an European village replete with a castle area. The main food area has a wide array of restaurant experiences including an irish pub (Beers of the World), a wood-fired pizza joint (Mamma’s Forno & Pasta), and super cute food trucks. Guests also receive 24 hour room service. 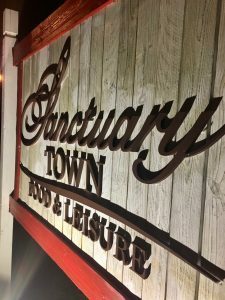 We enjoyed craft cocktails in the eclectic, funky, fun setting of Sanctuary Town. We were there at night, so I did not get a great look at the pool and beach setting in the light of the day (and also why my photos are a bit dark). The property has four pools, one of which is a saltwater pool. The beach is somewhat small…. The Sanctuary offers 184 rooms, which are elegantly decorated with a European influence. The property is now all-inclusive. 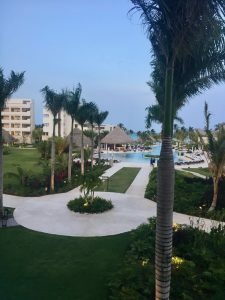 This is a great option for someone who wants a Punta Cana honeymoon at an all-inclusive resort, but doesn’t want to stay on a large property. 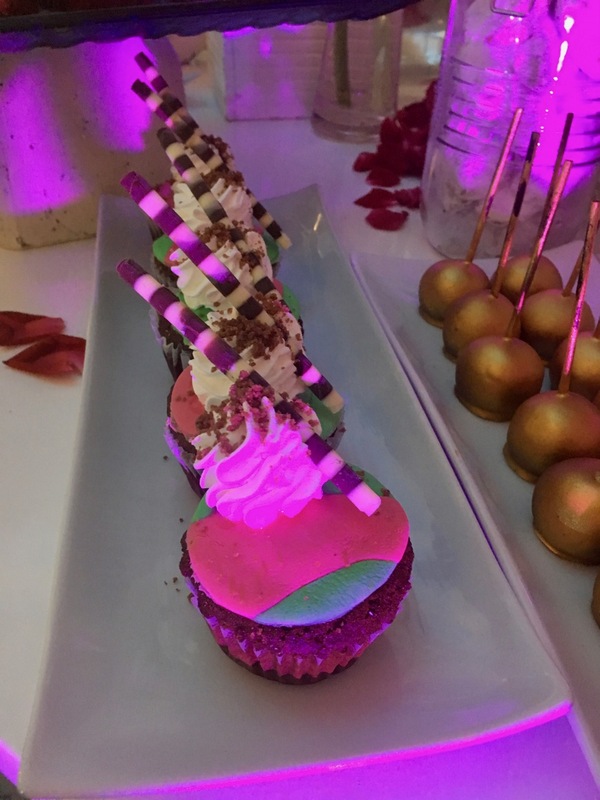 I wanted to stay longer and continue in the food revelry! 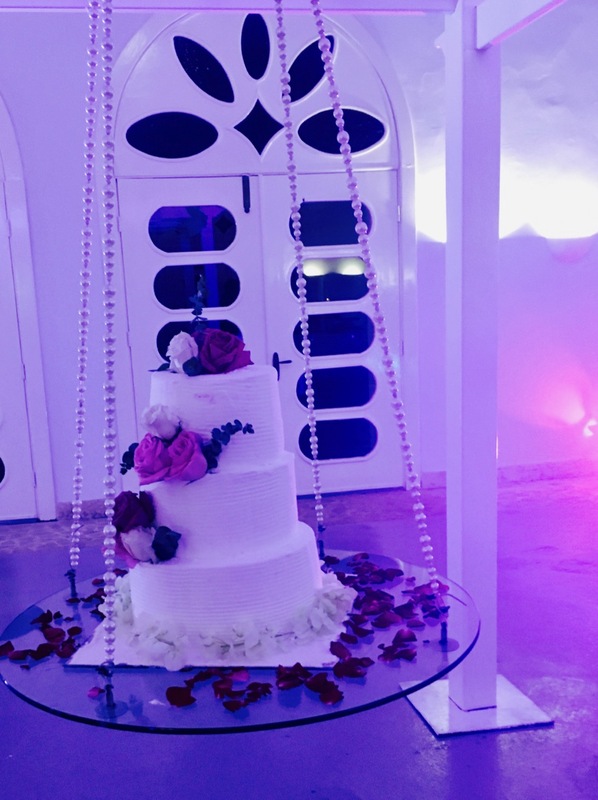 The Sanctuary also had the most creative wedding cake display—on a swing, encircled with other pastry delights…. We are the experts. 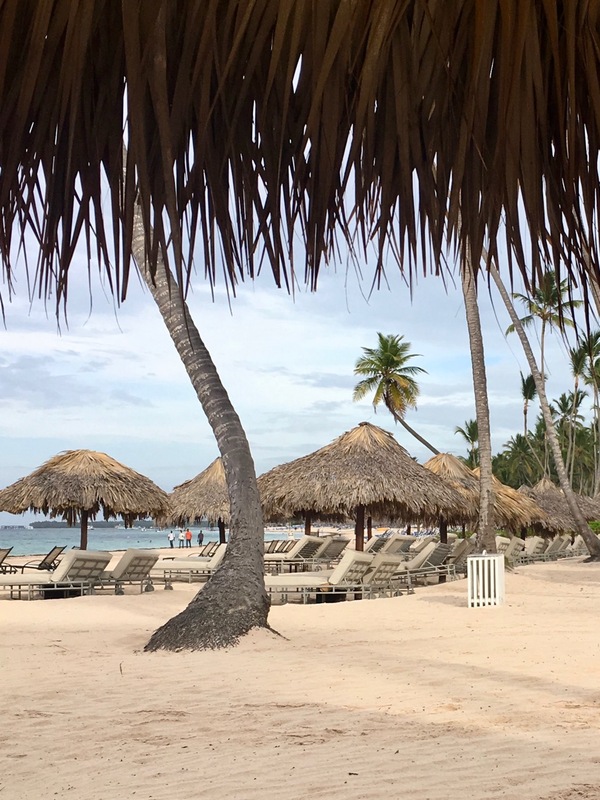 We have the connections you need to plan a special Punta Cana honeymoon (and beyond). 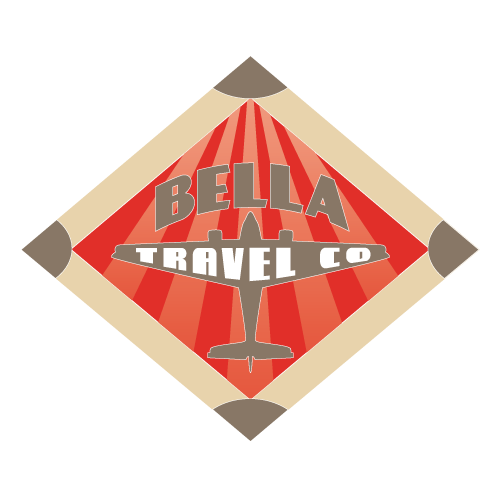 At Bella Travel Planning, we become specialists in YOU. We care about you and your honeymoon. Our planning services save you time. 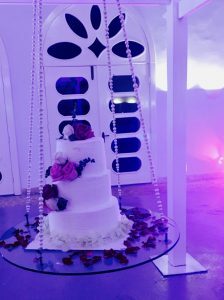 Our valued brides and grooms are busy planning their weddings and the honeymoon typically gets pushed to the side until it’s somewhat close in. 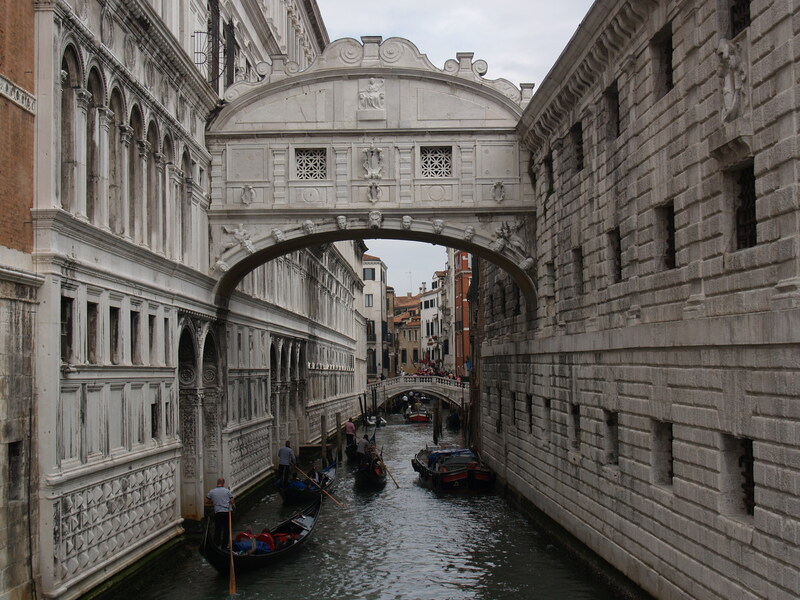 Pro Tip: The closer to your travel date you book your honeymoon, the more it will typically cost. 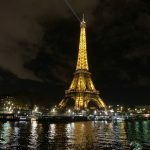 You should make your honeymoon travel arrangements and put the under deposit to lock in the price six to eight months prior to your departure date. We have the experience to advise you when to depart, which resort is the best fit for you, which destination is the best fit for you, what room categories are the best options for you, and more. Many times this is the first vacation you have planned as a couple. We can help navigate the process. 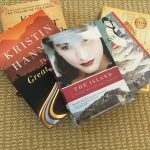 Everyone has an opinion of where to stay and what to do and they may not be reflective of your tastes, budget, and desires. 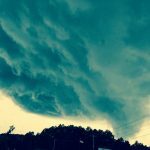 We give you advice to help! Our services do come with planning fees. For a honeymoon package for two people, our fee is $100 inclusive of all services including assistance while traveling and unlimited consultations. 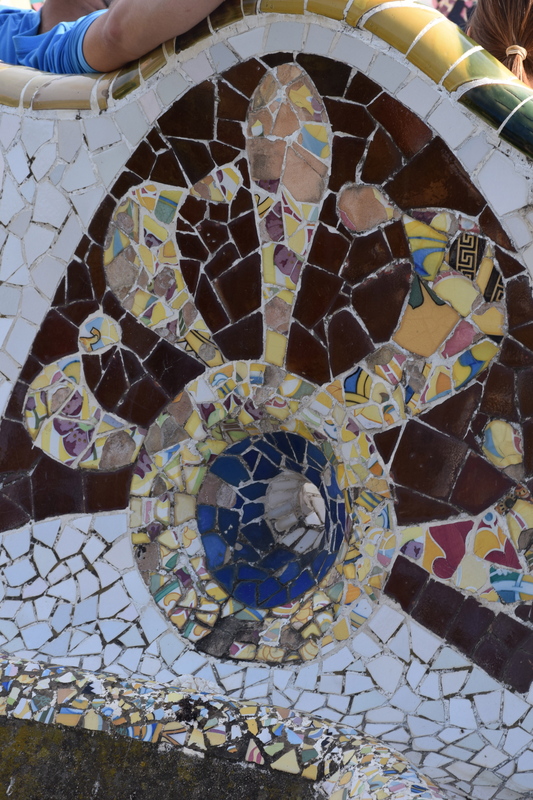 You can read more about our fees here. With our fees, we work for you not the cruise line or the tour operator. We become your Person. There are no honeymoon do-overs. We are here for you when you travel to help if you need assistance. Our clients receive our personal cell numbers to call, text, or email if there is a travel issue—even if it’s an early morning flight on a Saturday. Our clients do not have to go through an answering service or wait on hold to speak with someone who doesn’t even know you or your arrangements. 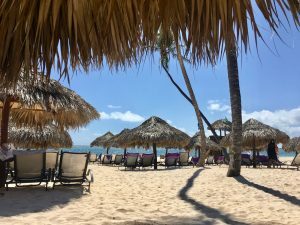 You speak with the same people who listened to your honeymoon dreams…the same people who helped you design your trip…you can’t say that about Costco, Expedia, Cheap Caribbean, or even the resort reservation line itself. Remember: You will be asked for the rest of your life where you went on your honeymoon. Let’s make it special! Becky Lukovic is a honeymoon and destination wedding specialist in the Greater Atlanta Metro Area. Her home is Roswell, Georgia where she plays tennis, drinks wine, and posts her food pictures on Instagram. You can follow her food and travel photos on Bella Luxury Travel’s Instagram. Next: How to set your honeymoon budget.